Uncover the delights of the Baltics during the legendary long summer days of the northern world. Savour the diversity of cultures, cuisines, politics and religions of the region, enjoying a cornucopia of attractions that will enchant all the senses. Over centuries, wars and conflict may have divided the Baltic nations, but trade has been a great unifier as the Hanseatic ports brought wealth and knowledge to these shores. Welcome to Amsterdam where your journey into wonder begins with a warm greeting by the crew as you step on board Scenic Eclipse. Raise your glass this evening and toast the start of your luxurious cruise. Please book your flight to arrive prior to 1pm. 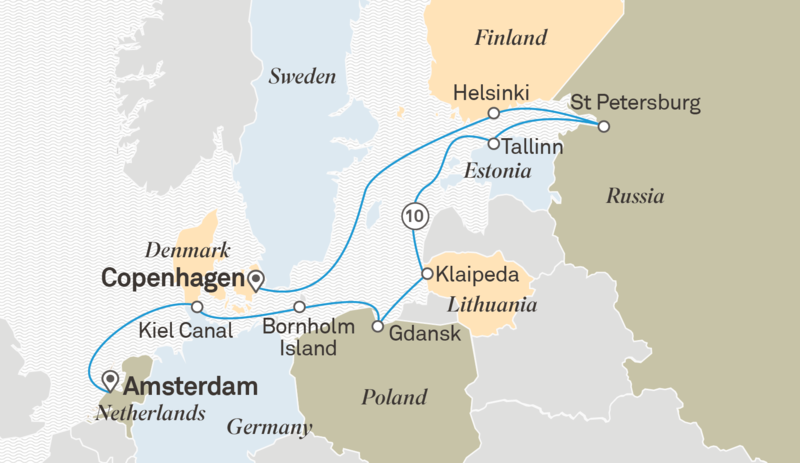 Dating back to 1895 this 98 kilometre long canal links the North Sea with the Baltic Sea and is spanned by seven high-level bridges. Enjoy an afternoon of scenic cruising through the backyards and gardens of the locals who call this region home. Set sail for the easternmost point of Denmark and discover the unique islands of Bornholm and Christiansø. Discover Bornholm and the pretty town of Svaneke. Visit Christiansø Island and see the fortress of King Christian V or explore the bird sanctuary at Græsholmen. Centuries of maritime heritage has shaped Gdansk into a charming destination.It is also the birthplace of the Solidarity movement led by Nobel Laureate Lech Walesa. Discover the historic centre dating back to the 16th and 17th centuries on a walking tour or explore the World Heritage-listed Teutonic Order Castle of Malbork. Alternatively, visit Stuthof Concentration Camp or take a panoramic tour of the Tricities of Gdansk, Sopot and Gydnia. Discovery: Choose a Scenic Discovery bicycle tour. Lithuania’s only port, Klaipeda will fascinate and delight. Discover the small and charming city of Klaipeda or explore the World Heritage-listed Curonian Spit ecosystems. You'll be surprised by Estonia’s small capital with its medieval walls and picturesque Old Town. Take a walking tour of the historic centre with its picturesque churches and medieval streets or take a panoramic tour. Alternatively, explore the Estonian Maritime Museum with over 200 items on display including a century old icebreaker, the remains of the oldest ship in Estonia, a submarine and more. The sheer grandeur of this former Imperial Capital will amaze and delight. On a panoramic tour see fabulous palaces and cathedrals. Take advantage of an overnight stay to see this magnificent city by day and by night at your leisure. Witness a private music and dance performance. Be seduced by Peterhof’s Upper and Lower Gardens or visit the magnificent Hermitage Museum. Alternatively, explore St. Isaac’s Cathedral or take a leisurely cruise along the canals admiring the grandeur and beauty of this magnificent city. The trendy Finnish capital, blends stunning natural surrounds with contemporary design. Explore the Seurasaari open-air museum showcasing Finnish wooden architecture or tour this interesting city and visit the Temppeliaukio Church carved out of the natural bedrock. Alternatively, visit Suomenlinna island and enter the World Heritage-listed fortress. Discovery: Take a Scenic Discovery bicycle excursion. Your cruise ends this morning as you farewell the crew and disembark, taking away memories of a truly unforgettable experience. Please book your flight to depart after 12pm.